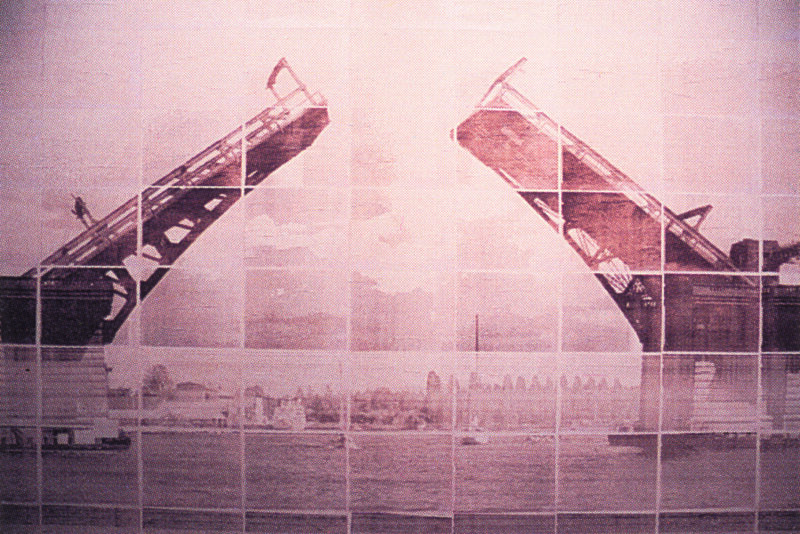 At the time of the opening of the exhibition “In Public: Seattle, 1991” at the Security Pacific Gallery, Seattle, Washington on June 27, 1991, the artist broke the image of an open drawbridge into a grid of approximately 250 single pages and faxed them to the gallery, where the images were pasted to the wall in a predetermined order by the artist’s assistant, Mark McLoughlin. The sound of the fax machine was amplified throughout the space. The complete image of Seattle’s Fremont Bridge referenced an unrealized proposal for the Seattle Arts Commission involving a radio transmission from a drawbridge: as cars approached the bridge, signs resembling traffic advisories were to be set up to alert the drivers that the bridge was going up and that they should tune to a special frequency. While waiting for the boats to pass in a sometimes dreamlike sequence, the drivers sink into the dreams of others heard over recordings of tires crossing the metal grating of the bridge. With its rich multiple harmonics, this bed of sound underlying the dreams is reminiscent of a choir. Broeker, Holger, ed. Gary Hill: Selected Works and catalogue raisonné. Wolfsburg: Kunstmuseum Wolfsburg, 2002, GHCR 70, p. 157. In Public: 1991 Artists from Seattle. Documents Northwest. Seattle, Washington: Seattle Art Museum, 1992, unpaginated.